So I've made a bit of progress on Zombology this week, posting blind playtesting copies to the Leeds and London Playtest UK groups, I'm hoping to get initial feedback from those groups in a week or two, once they've met and had a chance to get a game or two in. I also got a few games in at Newcastle Playtest on Tuesday, my first attendance there in a while. I still haven't decided what I want to do re. board game publishing, so in the meantime I've been doing some work on my German learning app instead. I loved Duolingo, which I've spent a lot of time on, but I've finished the course now. I still practice every now and again when things show up as needing refreshing but certainly not every day any more. The main thing I didn't like about Duolingo was the lack of structure. You seemed to learn words in a haphazard fashion, and it was hard to see things that were related at the same time. I learn well when I can tabulate things in my head, so I've been writing another app for my phone to provide a more structured learning experience for myself. I started it months ago, and then in the Zombology publishing related excitement I shelved it for a while. Last week I went to Manchester on the train again for work on my own (which is unusual). I had my laptop with me to use in a demo once I got there, which gave me an opportunity to do some development on the train, and since then I've been cracking on, making some decent progress. At the moment I'm focusing on getting the basic functionality in there, rather than lots of vocabulary. That can always come later once it works. Hopefully I'll find it useful as my language learning journey continues. I had an established publisher who was vaguely interested, but he wanted to see blind playtesting feedback, which at the time I didn't really have. So getting the feedback from the Playtest UK network is useful for that route and will hopefully lead to a better game regardless of which route I take. The Newcastle Playtest group of which I'm (theoretically at least) an assistant organiser is part of a larger network of playtest groups across the UK. 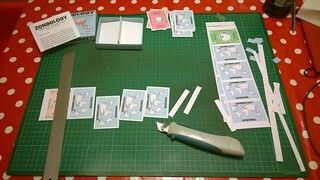 Playtest UK started in London and then spread to Cambridge before we became its northern-most offshoot. Since our creation, groups in Cardiff, Brighton, Leeds and Enfield have also joined, further strengthening the network. The group runs playtesting sessions at a number of UK conventions and members have published several games including Elysium, Relic Runners and Pocket Imperium. Brett J. Gilbert one of the co-organisers in Cambridge, who submitted a great game to me in my Reiver Games days, has since had great success being nominated for the Spiel des Jahres in 2013 and the Kennerspiel des Jahres this year. Since my appeal for blind playtesters last week on my blog garnered a grand total of zero applicants, I've decided to harness the power of the Playtest UK group by sending copies of Zombology to a few of the other groups for testing and feedback. Leeds and London have already volunteered (thanks!) and I've agreed to playtest a game for the London group in return. Hopefully this can be an ongoing arrangement where we harness the power of the wider group to gain access to willing (and knowledgable) playtesters who we don't have a close friendship with to gain the honest, critical feedback that you need as part of your game development. Blind playtesting is important for just that reason: to get people to test the rules without you there to clear up any inconsistencies and also to get honest feedback that isn't tempered by friendship. Honest feedback is critical to get a better understanding of how your game will be received outside of the group of friends you usually play it with. I spent Sunday evening printing and assembling their copies and will pop them in the post today. I look forward to getting an outsider's view of Zombology and using that information to help me plan my next steps. In other news, Newcastle Playtest had to rearrange our last meeting, since very few of us could make it a couple of weeks ago. It's now tomorrow. I'm in Manchester for the day for work again but fortunately we meet near the train station, so I can amble straight over on my return, I'll just arrive a little later than usual. I'm hoping to get some feedback from the guys on the new version, which is still yet to be played! If you'd like to try the latest version it's not too late to apply in the comments below. I've been quite busy with work again this week, including another long day's trip to our corporate UK head office in Manchester. But regardless I bravely soldiered on and got loads of gaming in. It's a hard job but someone's got to do it and, selfless man that I am, I took one for the team. You guys owe me. Wednesday's Games Night suffered extreme attrition and ended up just being Ian and me. We played Lost Cities, Firefly (one towards my ten plays goal!) with the Pirates and Bounty Hunters expansion (for the first time) and Carcassonne: The Castle (one towards play every game I own once this year). Firefly was done and dusted in only 65 minutes! That's about half the length of my shortest game to date. Ian and I have both played it a few times so we knew what we were doing and that made a big difference. I liked the new story card from the expansion, but we didn't really play and of the expansion PvP rules, just by being good space citizens rather than any determined effort not to. Then Saturday I finally made it to Newcastle Gamers for the first time in what feels like centuries. It was a great evening, I only played a couple of games, but it was great to catch up with everyone there and the games were good ones that helped towards my ten plays goal (Homesteaders and Aqua Romana - which is now ticked off the list). Finally, as I was leaving I spoke briefly to a few Newcastle Playtest regulars. Last time I went to Newcastle Playtest (also some time around 1530, I'm pretty sure Henry VIII was still on the throne), I'd left a copy of Zombology with Dan for him to take to the UK Games Expo playtest event. I've not seen Dan since, so I don't know if he got a chance to try it out, or what the feedback was, but I hope to see him next week. Olly said it felt like he hadn't seen me in ages, and I said that I'd missed the last couple of sessions due to travelling for work. I jokingly said it must have been weird having a session that didn't start with a couple of games of Zombology (it's our staple opening game while we wait for people to arrive). But it did! Dan took it along and they all played it without me! A good sign. Finally, after a few weeks of fannying on, I've finally printed out and constructed the new version of Zombology incorporating changes suggested during my trip to St. Louis at the beginning of June. I had the evening to myself last night as The Wife was out with friends, so after getting The Daughter to sleep I printed it out and made it all up. Excellent! Took long enough. I've been wanting to try this version out before sending it out for playtesting, but I have to miss this week's Newcastle Playtest because of travelling for work again, and I've not managed to fit a playtest in at work for a while either, so screw it, it's going out untested! It could be awful! It could be genius! Only one way to find out. I've contacted a few friends who have done playtesting for me before to see if they'll try it out and give me some feedback, but what I really need is blind playtesters who aren't friends of mine and are willing to try it a few times and give me some honest, critical feedback. Fancy helping out? Let me know in the comments. Give up on publishing myself and either make it freely available (print and play) or try to get a publisher to pick it up. Publish it in a time-light fashion, e.g. print on demand through a company like The Game Crafter or Drive Thru Cards. Or the original plan of a small, hand-made print run that I'll sell through my own website. If you'd asked me two weeks ago, I was utterly convinced that option 3 was the way I wanted to go, now I'm in the middle of a crisis of indecision. I'll give myself a couple of weeks to discuss it with The Wife and think things through, but then I'm going to have to make a decision and start acting on it. Still, at least with the finished prototype I've actually made some concrete progress this week.